at the authors' signing at the 2011 FNPS conference. Gil Nelson, botantist and author, is a tremendous friend of FNPS. He leads field trips, he's been active in the southeastern native plant societies' conferences, he speaks at our conventions, and he's written fanatastic field guides so those of us who are new to Florida can find our way around our gardens and parks. 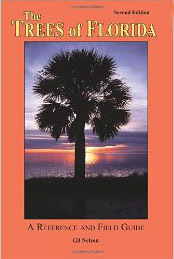 Now he's re-written his classic "Trees of Florida" originally published in 1994 by Pineapple Press. The new edition is greatly expanded and includes the origin of trees and whether they are listed as invasive. This information makes this field guide much more useful, because now readers will know what to do with a tree once they identify it. 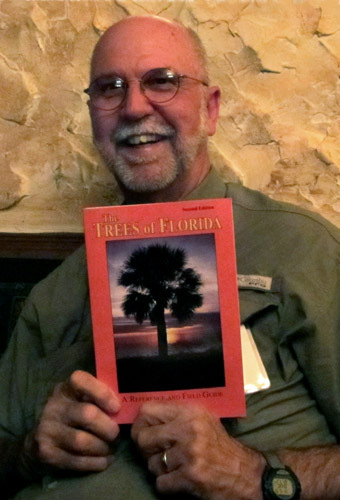 "The Trees of Florida is the most comprehensive guide to Florida’s amazing variety of tree species, both temperate and tropical, both natives and exotics. The first edition was very popular with both professionals and laypeople since it was accurate, comprehensive, and organized and written in an easy-to-understand way. This edition will be even more useful as it adds about 140 more tree accounts for a total of more than 480 species. There are almost 600 color photos and many drawings and range maps. And now included is a key to tree families that will help with field identification." Leaves: Needles, largely borne in fascicles of three. 15 -30 cm long (or longer), most commonly well over 20 cm long, extending from the branch in large globular clusters. Cones: Female cones usually longer than 15 cm; terminal buds silvery white. Distinguishing Marks: Distinguished from slash pine (P. elliotti) by silvery white buds and cones generally longer than 15 cm. Distribution: Statewide except southern tip of the peninsula and the Keys; natural stands of this species are becoming increasingly scarce due largely to the practices of the forest products industry. Form: Medium or large evergreen tree to about 40 m tall; branches and branchlets not tapering, remaining more or less thick and stocky to the tip. Leaves: Needlelike, largely borne in fascicles of 3, 15-30 cm long (or longer), more commonly well over 20 cm long, extending from the branch tip in large, distinctive globular clusters. Distinguishing marks: Distinguished from slash pine (P. elliotti) by combination of silvery buds, cones generally longer than 15 cm, branches and branchlets being thick and stocky to the tip, longer needles predominately in fascicles of 3 and borne in globular clusters at the branch tips; individuals with particularly long needles are easy to recognize. Distribution: Upland sandhills, drier flatwoods; statewide except the southern tip of the peninsula and the Keys; natural stands of this species are becoming increasingly scarce due largely to the practices of the forest products industry. Remarks: Longleaf pines once covered about 93 million acres across the southeastern United State, a quantity that has now been reduced to a few thousand acres of old growth trees, non of which occurs in Florida. 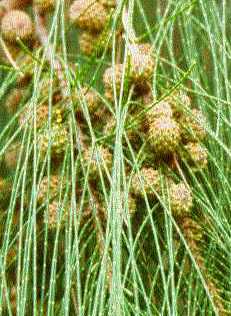 Longleaf is most abundant in dry sandhill uplands and is among the more ecologically important of Florida's trees. Its success in its preferred habitat is due primarly to its adaptation to frequent fire. Prior to fire suppression, Florida's pinelands ignited naturally, being set ablaze often by lightning from numerous thunderstorms. While wildfire keeps in check the growth of many species of trees and shrubsa, it has actually contributed to the longleaf's dominance in the landscape. Longleaf is a fire-adapted species that remains in a grasslike stage until the subterranean trunk reaches such proportions as to withstand fire. Depending upon soil, moisture, and competition, this grass stage may last as few as 3 or as many as 20 years or more. Once the underground trunk has reached sufficient size, the tree grows upward rapidly, as much as 1 m in only 12 months. Such growth elevates the growing tip of the longleaf above potential flames, thus ensuring protection. Other trees, no so adapted, do not tolerate frequent fires, resulting in nearly pure, parklike stands of longleaf pine with a sparse subcanopy and rich groundcover. Form: Small attractive tree with green twigs. Leaves: Alternate, simple, ovate, 4-10 cm long, 2-5 cm wide, upper surfaces shiny green, margins entire and waxy. Flowers: Small, cream colored, borne in loose, spreading clusters. Fruit: A rounded, black drupe to about 9mm in diameter and borne atop a cup-shape receptacle. Distinguishing Marks: Distinguished by leaves that give off a strong aroma of camphor when crushed. Distribution: Secondary woods, disturbed sites; naturalized in northern Florida, southward to the central peninsula. Form: An attractive, small to very large evergreen tree with green twigs; typically less than 20 m tall in Florida, but reportedly 45 m tall in Asia; trunk becoming large, potentially to nearly 5 m dbh, but not exceeding about half this in Florida; bark brownish, furrowed, and attractive on large trees. Leaves: Alternate, simple, ovate, 4-10cm long, 2-5 cm wide, upper surfaces lustrous green, margins entire and wavy; tapering to an elongated, acuminate apex; exhibiting a strong odor of camphor when crushed. Flowers: Small more or less inconspicuous, cream-colored, borne in loose, spreading clusters on stalks averaging about 7 cm long; appearing in spring. Distinguishing Marks: Distinguished by the lustrous leaves that give off a strong aroma of camphor when crushed. 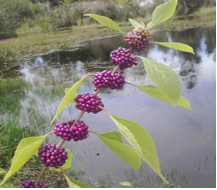 Distribution: Secondary woods, disturbed sites, naturalized in northern Florida, southward to the central peninsula. Remarks: There are more than 200 species in the genus Cinnamomum, most of which are found in India, China, and Japan. The camphor was introduced as a shade tree in Florida at least as early as 1875, was once a frequently used ornamental, and is now widely naturalized and common. The wood is the source of the same camphor oil that is used in the production of medicine. The tree's rapid expansion in the southeastern United States probably resulted from an early, and not very successful, attempt to compete with Japan and Formosa's industry. As you can see Gil has included important details that make the second edition well-worth the investment. Great improvements. Gil is indeed a wealth of knowledge and we are happy to have him as part of GNPS as well.